First Choice Physical Therapy: Say it loud! Laura M. wrote this short but awesome note. If I had known I was going to see/feel results this soon I would not have avoided Physical Therapy when first ordered by my primary physician last year. I recommend it highly to others now. Please be sure that you research all your options before making a decision regarding your health. 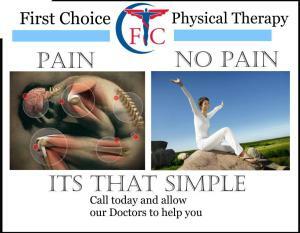 In many cases you will find that physical therapy offers great relief from body aches and pains. Enough to possibly avoid surgery or to reduce dependency on pain medication. Call us today to see if we can help you!